No, for the last time, the baby does not come with a handbook. And even if there were a handbook, you wouldn't read it. You'd fill out the warranty card, throw out the box, and start playing right away. Until a few hours passed and you were hit with the epiphany of, "Jeeze honey, what in the wide, wide world of childcare are we doing here?" Relax. Because we found some parents who thought of putting together a handbook for you with "word-of-mouth information"! They started in the Bay Area and now are working their way throughout the country and their Los Angeles/Orange County 2003 edition just came out! Everyone they talked to had some bit of child rearing advice about what baby gear store is the most helpful. Some nugget of parenting wisdom about which restaurant tolerates strained carrots on the floor. It all really seemed to help. And that's when, the lilaguide was born! 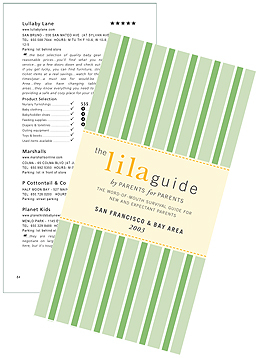 The guide is literally written by parents for parents. It's what happens when someone actually does write it down (and organizes it, calculates it, and presents it in an easy-to-use format). Thousands of surveys produce these insider's guides to stores, restaurants, service providers, and activities that are about to become a very big part of your life. And while this guide won't tell you how to change a diaper or how to get by on little or no sleep (that's what grandparents are for), it will tell you what other local parents have learned about what your amazing area has to offer to our blessed new parenting breed. So there you have it. Now go make some phone calls, clean up the house, take a nap, or do something on your list before the baby wakes up. Oh, and don't forget to participate in their survey - other parents are counting on you to tell them where to go and what to do! she has a knack for finding the right moments to take beautiful pictures..."